At least as early as 1650 there were Baptists in Wymeswold. In 1676 there were 80 Nonconformists over the age of 16, among them Quakers and Baptists. In 1700 there were 25 Baptist families and soon after the Methodist movement arrived. Wymeswold appears to have had more Nonconformists than most other parishes in Leicestershire. The reason for this is not clear. One reason may be that the vicar at the time of the Restoration, the Rev Edward Hathaway, appears to have paid little heed to the Common Prayer Book. During the 22 years of his tenure(c.1658 to c.1680) not a single baptism is recorded in the registers. He was succeeded by the Rev John Orme who baptised a number of adults; indeed, he was far from sympathetic to its predecessor's outlook and generally harassed his Nonconformist parishioners. More recently the Rev S.Y. Richardson has suggested that parishes which had a Lord of the Manor were more likely to remain High Church; Wymeswold had no such central figure and the villagers would have had fewer constraints on their preferences. 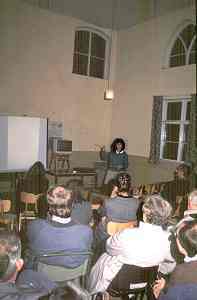 In any event there have been at least five Nonconformists meeting houses and chapels in the village, representing the Anabaptists, Quakers, Baptists, General Methodists and Primitive Methodists. From 1567 many Anabaptists fled the persecution in the Netherlands and settled throughout southern and eastern England. During the 17th-century the English Baptists developed as a group, with the Anabaptist ideas surviving mostly in the form of adult baptism practised by the General Baptists. In 1624 in Fenny Drayton, on the other side of Leicestershire, George Fox was born, the founder a world-wide spiritual movement. There was much in common between Quaker and Anabaptists beliefs although the Anabaptists allowed baptism and communion. But there is no record of the meeting together and the two traditions developed independently, as is demonstrated by the two separate chapels in Wymeswold. On Brook Street the house numbered 71 is known as 'The Quakers'. It was, in fact, the 17th and 18th century meeting place of the Anabaptists. In the 19th century Joseph Dawson ran a school at this house for 26 years. The Quakers met another cottage belonging to John Fox, on east side of The Stockwell. No.71 Brook Street in 2002. The Burial ground to the side of 'The Quakers' contains gravestones dating from 1715 to 1840, the majority being of the 18th century. The burial rights still exist and are written into the modern deeds. The ground has been disturbed several times over the years and only a few headstones are in the correct position. They are of slate and generally in good condition, some beautifully decorated by the Winfield family. Some record pious tributes to the deceased which, sadly, include several young children. The main families are Woodroffe, Freer and Bissill. Reputedly the most famous occupant of the graveyard was William 'Billy' Burrows, known as 'The Giant of Wymeswold'. He was 7 feet tall and of matching strength, but also with a reputation for gentleness and good nature. He was buried very deeply under a large stone to prevent his body being disturbed for medical research. Unfortunately his headstone has not survived. On 12th February 1636, John Fox, the eldest of four sons of William Fox and Isabelle his wife, was baptised at Wymeswold Church. Although not related to George Fox, John Fox was to become the most prominent of the 17th-century Wymeswold Quakers. While he never suffered the extremes of imprisonment and torture undergone by other early Friends, his story nevertheless shows how relentless and undermining the less spectacular persecutions were. John Fox, a yeoman farmer, also kept the general store in the village. 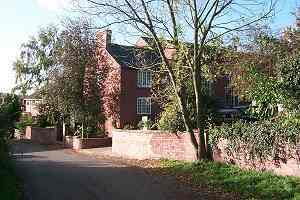 His house was on east side of The Stockwell, now number 2, and was used as the Meeting House for the Society of Friends. The first written evidence of Quakers meeting in Wymeswold occurs in the Wymeswold Town Constable's accounts for 1665 (cited in Potter). In 1669 the Bishop of Lincoln mentions 'about four' Quakers; the Quakers' own records for 1671 mention the Wymeswold meeting and during the 1670s there was a strong Quaker community holding regular meetings. The house on the right-hand side of this picture of The Stockwell may incorporate John Fox's house and shop. Photograph taken in 2002. In 1677 George Fox himself came and in his journal for that year we read "I went the day following John Fox's at Wymeswold". Names mentioned often in these records include John Fox, William and Mary Marshall, Elizabeth Shepherd, Edward Belton and William Waite. One Richard Loat, a member of the Meeting, was judged unfit due to 'Infidelity'. It is not clear whether this was to the Society or to someone else. In 1679 one John Smith arrived in Nottingham and settled in Hoton. His arrival boded ill for the Quakers because his trader was that of informer. The oventicles Acts of 1664 and 1670 made the holding of dissenting meetings punishable by fines or imprisonment. Fines of up to £20 were normal and the zeal of informers such as John Smith was ensured by the reward of one-third of any fines recovered. John Fox was fined for attending meetings in 1679 and 1680. When he refused to pay, as the Quakers always did, the Justice of the Peace took "two brass pans and a bass pot" in destraint. In 1683 Fox was again fined for holding a Meeting for Worship. 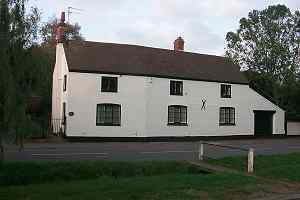 In due course the informer, John Smith, as assistant, Thomas Warner, the Constable Robert Milner, the 'Headborough', the Churchwarden and overseer of the poor, came with a warrant, entered Fox's house and shop and took what goods they could carry out. They then went into Fox's field where "they made free of a hayrick", and took the goods away in carts. One of the overseers of the poor was John Fox's brother Joseph. He was not a Quaker but bought the goods himself for £21. The 1681 of the unpleasantest examples of persecution of the Wymeswold Quakers occurred, again over an unpaid fine imposed for having held a Meeting for Worship. Only the full entry from The Record of the Sufferings the People called Quakers in the County of Leicester and Rutland can do justice to the incident. On June 24th at 4 a.m. informer Smith and a Constable went to Fox's house to seize goods and "finding the doors locked, looked about his yard and outhouse and privy, and not finding as much as would satisfy his insatiable mind would have the doors opened, but it being refused he would have had the officers to have broken open the door, and for some time the officers did attempt to break the door, pounding against it with a piece of wood several times, and he did charge the aforesaid officers to do as much  but they, not being as forward as he, did not break it at that time. So the Informer did threaten to fine the officers for their neglect and they being fearful to fall into his hands, offered to pay the fine." Then we get an insight into the goods sold in a village store at the time. On June 30th, "the aforesaid officers came into [Fox's] shop and carried out his shop goods, 8 nests of boxes with the goods that was in them, one chest and the counter with the things in them  also buttons, silk, Manchester ware, thread, canvass, flannel, wool cards, hair cards, soap, alum, rope, hemp and flax". They broke open the locked doors and took out all the coals and kitchenware. Next day they then came back and took his hay and coulter. In all they took goods amounting to £21 in value, but sold them for £10. Finally, at the end of that year, matters came to a head. In November John Fox held a Meeting for Worship and was fined £20, which he again refused to pay. On December 2nd John Smith arrived take away Fox's possessions. When Fox made an objection to the warrant, Smith, "In a rage snatched it out his hands and called him the son of a whore and kicked his hand, so, Thomas Warner soon came with more officers, a cart and horse, and Thomas Stubbs a carpenter, who took the bed stead in pieces while informer loaded away other household goods so that they left little of any value, except one bed that his wife was in, she being not well and had a young child as sucked on her; for they took both meat and drink and the casks as the drink was in. They took up the matting that was nailed to the floor and wrenched up the bench that was fixed in the house and got a plough coulter and pecked up the copper that was fixed in a furnace of limestone and bricks. They took his cows, hay and swine troughs, and a horse trough. This raised 14s 3d, which was not enough, so the Informer returned with William Fox, a churchwarden and with threats and physical force made Fox's maidservant unlock all the doors. Smith then threatened the officers that "If they left anything worth a penny he would make it costs them £5 a man. They took clothes, bedsteads, linen, dishes, pans, bellows, hooks, hats, hose, shoes, oatmeal, salt, floor cupboards, bolster, shelves, warming pans." Afraid they might have missed something the officers gave Smith 6d in lieu of it. "They were ransacking his house and carrying away goods "till the eighth hour of the night. It being a cold season his whole family, being himself, his wife, two maidservants and four young children  the eldest of them not four years old, was forced to lodge in the town having neither bed nor bedding left in the house. The children and most of them got such colds that they were very ill for a great while." Goods taken were valued at £8 11s 3d and were sold to Thomas Warner for £2 2s 6d. After this sorry episode they were only minor annual persecutions, probably in lieu of the tithes to the church which Quakers refused to pay. John Fox died in the spring of 1717 and in his will provided the Wymeswold Quakers with a two-bay house on The Stockwell to form a permanent Meeting House, with its orchard to form a burial ground. This orchard had already been used to bury John and Elizabeth Fox's eldest son, George, when he died in 1696 at the age of nine. Their surviving son, Samuel (born1695) and his cousin, also John Fox, carried the Quaker tradition in Wymeswold through the first half of the 18th century. The Meeting House is mentioned in journals and wills throughout this period but Samuel left the village in 1713 and after John died in 1750 the history of the Wymeswold Quakers fades into obscurity. In 1802 grandson of the elder John Fox sold the Meeting House and in the same year another member of the Fox family sold the adjoining land on which the Methodist church rooms were built [now a house]. Baptists have worshipped in Wymeswold since at least 1650. In 1760 the Loughborough Circuit was formed with just 15 members, two or three of whom were from Wymeswold. During the next ten years this number grew to 240 and by 1782 there were 444 members. 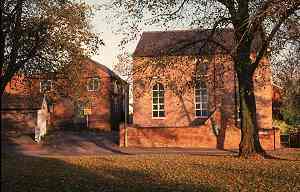 Most Wymeswold Baptists met in private houses until 1781 when the Wymeswold Baptists built their own chapel in Wysall Lane. As membership grew the building was enlarged in 1815 and in 1847 the school rooms were added. Richard Thorman was the first pastor of Leake and Wymewsold and his memorial stone can be seen on the wall of the chapel. In 1964 chapel was converted into a private house thus ending over 200 years of continuous Baptist worship in Wymeswold. The former Baptist chapel in 2000. The first clear indication of a Wymeswold Methodist society is in 1771; 40 years later the earliest surviving records show 47 people in full membership  there were, doubtless, many others who attended services. The house to the north of the present Methodist church, latterly the Methodist Sunday School, was the first Methodist Church, then known as the Wesleyan chapel. It was built in 1801 and among the legal documents is a conveyance of a "now erected building" on the land of Thomas Fox, farmer, to be used by "the society or congregation of Protestant Dissenters called Methodists". This chapel served their purposes for over twenty years but in 1827 they decided to make some improvements and enlarge it  hence the large flat roof on part of the building. When it was reopened the records say two excellence sermons were preached by the Rev R. Treffry of Nottingham and the sum of 13 guineas was collected. Twenty years later the chapel became the Sunday School. 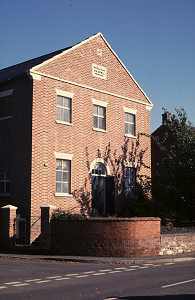 Until sold in the early 1990s it was the oldest Methodist building in the Loughborough circuit. According to a legal documents a new chapel was "being built" in 1848, although other sources suggest it was already built by 1845. The building of the present chapel in the 1840s implies that the Wesleyan society in the village was prospering. The Wesleyan Methodists appear to have coexisted with the vicar at the time, Henry Alford, quite happily  there were two Methodist schoolmasters in the village school which was managed by the vicar. Methodism in the 19th century was associated with various internal rifts. The first Primitive Methodist meeting held in the village was on May 7th, 1818, the open air. Their chapel was ready for use in 1830, on land given by Mr B Sheldon. But the 'Prims' here did not thrive after about 1850 and by 1894 chapel was sold to John Hallam for £55. It eventually became a dairy and was demolished in 1989 to make way for sheltered accommodation. The Wesleyan Methodists now have the only Nonconformist chapel in the village. A full account of their history can be found in Methodism in Wymeswold by S.Y. Richardson, 1985. 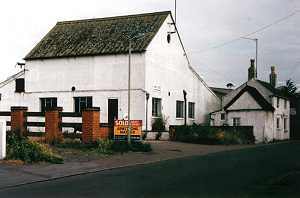 (just prior to conversion into a house) in 1993. The interior of the Methodist Sunday School in 1989. In the early 1990s the Methodist Chapel was renovated. At this time the Methodist School Rooms were sold and converted to a house. Wymeswold Methodist chapel in 1993 after restoration. Originally published in A Portrait of Wymeswold 1991, updated 2002. Copyright Wolds Historical Organisation. Unless otherwise credited photographs copyright Bob Trusbhaw.